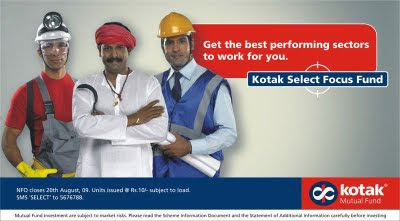 Kotak Mutual Fund recently came out with a New Fund Offer named Kotak Select Focus Fund. Kotak Select Focus Fund intends to focus on Select Sectors with untapped Current and Future Growth potential. Fund Manager Mr.Krishna Sanghvi says that this Fund provides adequate diversification compared to a Single Sector Fund while at the same time providing benefit adequate concentration in the portfolio on certain sectors expected to show strong performance. The Fund will aim to invest in Six Sectors at a time. The Fund is positioned between a Sector Fund and a Diversified Equity Fund and thus fails to either enthuse Aggressive Investor or the Risk Averse Investor. Also, with a target of having about 60 stocks in the Portfolio, the Fund fails to classify as a Sectoral Fund, which its name suggests. The Fund seems to be more of an extension of Kotak Opportunities Fund with a Sectorial bias. Having Three Fund Manager could also result in too many cooks spoiling the broth. The Difference between Sundaram Select Focus Fund and the Kotak Select Focus Fund is that Sundaram focus on Specific Stocks and Kotak tends to be more focussed on Top Down Approach i.e, Sector Focussed. So, even if a Stock looks attractive, the Fund will shy away and NOT invest in the Stock if the Sector outlook does not look rosy. A separate Fund Manager for Debt portion too makes the Fund unsuitable for a Risk-Ready investor looking for a 'Alpha' to his returns. Kotak AMC has a good track record in almost all its Funds but still the Fund confuses investors with its 'neither here nor there' approach. The ball is in your court. The Fund is obviously not for the First Time Investor. I suggest AVOID.